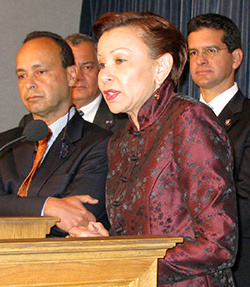 Congresswoman Nydia Velázquez is used to being “first.” She was the first in her family to earn a college degree, the first Latina to serve on the New York City Council, the first Puerto Rican woman elected to the U.S. House of Representatives, and the first woman to chair a full committee, the House Small Business Committee. And now she’s the first Puerto Rican woman to chair the Congressional Hispanic Caucus. Politics is in her blood. Born and raised in Puerto Rico, a country where politics is often characterized as important a passion as baseball, Velázquez grew up with political discussion as a main course at the dinner table. Her father worked the sugar cane fields, and was often organizing workers against harsh work conditions. Young Nydia often accompanied her father to worker rallies, and in high school organized her classmates in a protest against conditions at the school that forced officials to shut it down until repairs were made. Velázquez took that feistiness to Congress, rising up the ranks to chair a non-traditional committee for female members and shaking up the old guard. The former college professor is known as very collegial but also not afraid to ruffle some feathers to get answers for her constituents. In one memorable moment several years ago at a Congressional hearing, a recalcitrant U.S. Navy officer was on the receiving end of a pointed statement from the Congresswoman that she would “make his life” miserable come appropriations time if he didn’t answer her questions on naval activity on the Puerto Rican island of Vieques. These days, she’s heavily involved in small business issues, but also in pushing for more attention and funding for education, healthcare and financial services, particularly in underserved communities. She caught her breath for a few minutes to talk with LATINO Magazine on Capitol Hill in the heart of the legislative hustle and bustle. You’re the new Chairwoman of the Congressional Hispanic Caucus. Do you bring new energy, and a more aggressive approach to the Caucus? Yes. We have no time to waste. The dire needs of our country are just incredible, given the economic crisis that is impacting working families, particularly Hispanic families. What is the role of the Hispanic community? We need to come together as a community and seize this opportunity, now that we have an expanded majority in Congress, and a White House that understands the crucial needs of our community. So it is up to us to come together to strategize in putting together a legislative agenda that reflects the real issues of our community and push that agenda forward. What is it that you’re going to be doing that’s different from what’s been done in the past so that the White House and the congressional leadership pay attention to the Caucus? We in the community have broad-based representation of Latino organizations throughout the country. And it’s important for them [the White House and leaders in Congress] to know that this community is behind us. And we need to establish this synergy, this interconnection and interrelationships between us, members of Congress and Latino organizations. So that when we need them to be activated, they will be there at a moment’s notice to come to Washington and do the kind of lobbying that we need to do for ourselves. In the past you had said that you weren’t necessarily interested in being the Caucus chair because you wanted to pay attention to small business issues. But here you are doing both now. What made you change your mind? Well, I think that I reached a point where I do know the Small Business Administration programs and the kind of modernization that needs to take place to modernize programs that are providing services to minority businesses. And so, I felt good about the fact that I knew everything I needed to know to make a difference for the Small Business Administration, and I was prepared to take the helm of the Congressional Hispanic Caucus. One of the big problems the country faces is the economy. What are you doing as Chairwoman of the Caucus and the House Small Business Committee to deal with that? I work with President Obama. I participated in the small business economic summit that he held in the White House [earlier this year] and I work with the appropriators here in Congress to put provisions in the economic stimulus package targeting Latino-owned small businesses---from lending to new investments. How will these provisions help Latino entrepreneurs? We made it more flexible for the Small Business Administration to lend to small businesses. For the first time, we created a direct lending program that will help provide loans to those businesses that are having problems right now. We are working hard for Latinos and Latino-owned businesses.